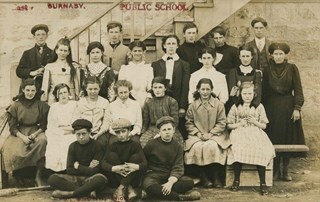 Photographic postcard of a class at Edmonds Street School. Stamped at top of postcard: "East, Burnaby. / Public School." Stamped at bottom of postcard, "W. Brown, Photo." Front row, left to right: George Gregson, [unidentified], and George Powys. Second row, left to right: Phyllis Brown, Hazel Allen, Etta Bonsor, Mary Buchanan, Jane Allen, Lila Skelly, and Eileen Jordan. Third row (girls standing), left to right: Margaret Stride, Lucy Jackson, Esther Love, Grace Morrison, Lillie Lewis, Anna Doole, and Lillie Vernon. Back row (boys standing), left to right: Burnie Feedham, [unidentified], Leonard Ettinger, Edward Clayton, and Mr. Lowther (teacher).